Code Signing, which allows you to add digital signatures to your executables, enables software developers to include information about themselves and the integrity of their code with their software. The end users that download digitally signed 32-bit or 64-bit executable files (.exe, .ocx, .dll, .cab, and more) can be confident that the code really comes from you and has not been altered or corrupted since it was signed. Customers can tell who published the software, and they can verify that the software is still in its original shrink-wrap. These factors enable customers to make decisions about what software to purchase and how much to "trust" those products. Customers who download digitally signed files (including .exe, .cab, .jar, and more) or drivers from your site can be confident that code really comes from you and hasn't been altered or corrupted since it was created and signed. Digital IDs serve as virtual "shrink-wrap" for your software: after you sign your code, if it is tampered with in any way, the digital signature will break and alert customers that the code has been altered and is not trustworthy. The solution to these issues is Code Signing. Most platforms have their own Code Signing standard, for example Microsoft's Authenticode technology. Code Signing, through the use of digital signatures, enables software developers to include information about themselves and their code with their software. Users benefit from this software accountability because they know who published the software and that the code hasn't been tampered with. Developers and Web masters benefit from these Certificates because it builds trust in their names and makes it more difficult to falsify their products. By signing their code, developers build a trusted relationship with users, who learn they can download software signed by that publisher or Web site with confidence. And users can make educated decisions about what software they want to download, knowing who published the software and that it hasn't been tampered with. Code Signing is widely used to protect software that is distributed over the Internet. Code signing does not alter your software; it simply appends a digital signature to the executable. Use digital signatures when you want to distribute software, and you want to assure recipients that it does indeed come from you. This digital signature provides enough information to authenticate the signer as well as to ensure that a code has not been subsequently modified. Code Signing Digital IDs (or certificates) allow content publishers including software developers to sign their content that includes software objects, macros, device drivers, firmware images, virus updates, configuration files or other types of content for secure delivery over the Internet. Digital signatures are created using a public-key signature algorithm such as RSA. A public-key algorithm uses two different keys: the public key and the private key (called a key pair). The private key is known only to its owner (the developer, in this case), while the public key is available to anyone who needs it (and is included with the digital signature). Public-key algorithms are designed so that the two keys can be used together for secure signatures and encryption in a wide variety of technologies. In digital signatures, the private key generates the signature, and the corresponding public key validates it. Any software publisher planning to distribute code or content over the Internet risks impersonation and tampering. Even code distributed through an intranet should be signed due to policies set by operating systems such as Windows and macOS. Modern systems prefer signed code as it helps them ensure the user's safety and makes it more difficult to distribute malware. Comodo Code Signing Digital IDs for Microsoft Authenticode protect against these hazards. Comodo offers Digital IDs designed for commercial software developers, companies, and other organizations that publish software. This class of Digital ID provides assurance regarding an organization's identity and legitimacy, much like a business license, and is designed to represent the level of assurance provided today by physical retail channels for software. Digital signatures protect and reassure your customers by assuring them that the integrity of the code they download from your site is intact - that it has not been tampered with or altered in transit. After downloading, end users can be sure that the code they obtained really came from you, helping you preserve your business reputation and intellectual property. Digital ID's allow customers to identify the author of digitally signed code and contact them should an issue or query arise. Operating systems including Windows, macOS, and iOS are adopting policies that restrict software unless the code is signed by a certificate from a trusted Certificate Authority, such as Comodo. Code signing certificates are easy to use in conjunction with the vendor software tools that developers use to create products, macro's and objects. 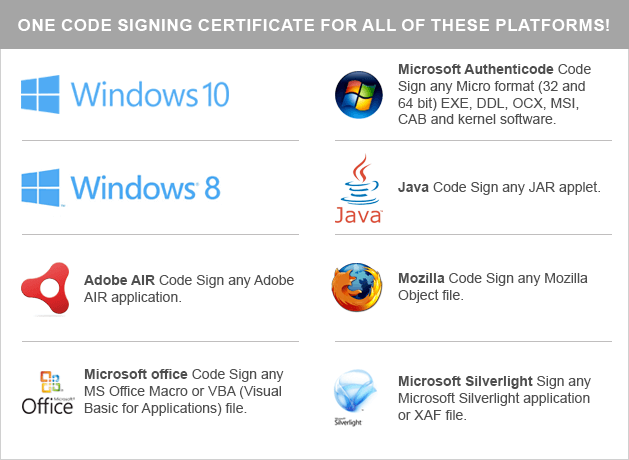 Comodo's Code Signing certificates work with Signtool.exe, Authenticode, and Microsoft's kernel-mode code signing. Widely supported - Compatible with major platforms including Microsoft Authenticode (including kernel-mode signing), Apple applications (XCode and the Mac App Store) and plug-ins, Java, MS Office Macros and VBA, Mozilla object files, Microsoft Silverlight applications, and Adobe AIR. Comodo Code Signing Certificates help create a sense of online confidence when users download your software by verifying the authenticity of your identity. With a Comodo Code Signing certificate you can sign code under your personal name (for independent developers) or a legally registered business name. But, before you can display either your company name or individual name as the publisher, Comodo requires you to complete an industry standard validation process, which typically takes 1-3 business days. For companies, Comodo will attempt to verify your registration details, address and telephone number. For individual developers, Comodo requires you to present a notarized form that validates government issued photo identification and complete a quick phone confirmation. To streamline the process, we'll provide you with an easy-to-read validation guide after purchase. Authenticode uses digital signature technology to assure users of the origin and integrity of software. In a digital signature, the private key generates the signature, and the corresponding public key validates it. This Comodo Code Signing certificate provides the tools you need to sign executables using the Authenticode standard. Publisher obtains a Code Signing Digital ID from Comodo. The end user downloads or runs the executable. The end user's browser or operating system (depending on the scenario) examines the publisher's certificate and signature. Comodo's Root certificate, which is recognized and trusted by major platforms allows the platform to recognize the certificate and confirm the signature comes from a trusted Certificate Authority. The end user's software verifies the signature by comparing the signed data to a locally-computed hash. If they are identical, the platform knows that the executable file it has is identical – down to each bit – to the executable signed by the publisher. This provides cryptographic proof that there have been no malicious or accidental alternations to the code. The entire process is seamless and transparent to end users, who see only a message that the content was signed by its publisher and verified by Comodo. These instructions provide an overview of obtaining and using Microsoft Authenticode and a Code Signing Digital ID from Comodo. In the process of applying for a Code Signing ID, your browser will generate a private key. You should store this private key securely and never distribute it over the internet. Ideally you keep the private key on a disk or other offline medium so it cannot be easily accessed should your computer be compromised or stolen. Please make a back-up copy of this private key, as you will need this key to sign code. This key is never sent to Comodo, so if you lose this private key, you will be unable to sign code. If this key is lost, please contact us and we can help you re-issue the certificate for free. If the key is stolen, please get in touch immediately as this is a serious safety concern. Once you have completed the application process, Comodo will take a number of steps to verify your identity. For commercial publishers, Comodo does a considerable amount of background checking. As a result, it will take approximately 1-5 days to verify your information and issue a Digital ID. At the end of this process, Comodo will send you an e-mail with instructions on how to download your Code Signing certificate. Please note that you must use the same machine to apply for and obtain your Digital ID. You can then move the private key and Digital ID to sign files on any of your development machines. If you are building any executable file (.exe, .ocx, .dll or other), you need not do anything special. For cab files, you need to add the following entry to your .ddf file before creating the cab file: Set ReservePerCabinetSize=6144. Every platform (Authenticode, XCode, etc) has specific procedures and steps for signing your code. Consult with that platform's documentation. You can now sign your file/executable. To sign with Authenticode, you will use the SIGNCODE.EXE utility included in the ActiveX SDK. You will also need your Digital ID file (generally called MyCredentials.spc) and the private key. The Microsoft SDK contains a utility called chktrust.exe. This may be used to check your signature before distributing your file. If your code signing process was OK, this will bring up a digital certificate. Congratulations, you have just digitally signed your file. When this file is downloaded it will display the same certificate to the user. If the file is tampered with in any way after it has been signed, the user will be notified and given the option of refusing installation. Please note: This product requires you to complete Telephone Verification. For new customers/orders after October 6th, 2016, Comodo requires either a Dun and Bradstreet, BBB.com listing, or a Legal Opinion Letter to complete telephone verification. Other third-party telephone directories such as Yellowpages.com will not be accepted after this date. If you cannot complete these options, please contact support at support@ComodoSSLstore.com as we have other solutions that may be easier for you to complete.